We have all heard the melodies of birds around us, in both the city and the countryside. But why do birds sing? Are all birds capable of "singing"? Birds do not have vocal cords to emit sounds, but instead have a device called the syrinx which is located in the neck at the base of the trachea. The greater the quantity of muscles and cartilaginous rings that are associated with the syrinx, the more complex the sounds emitted may be. Are all birds capable of "singing"? Not all birds can produce sounds that we consider "melodious". Many species produce mechanical noises, for example by opening and closing their beaks (e.g., storks) while others produce sounds by utilizing the wind to move their feathers. Vocal sounds classified as calls, are short and repetitive sounds that serve for communication between members of a group of the same species (e.g., greeting or warning calls). Warning calls may not only be interpreted by members of the same species. Other bird genera and even some mammals have evolved to know that a certain call from a species means that a predator is nearby. Other vocal sounds are the songs that are normally produced by males to attract females. The birds that emit sounds that are most agreeable to us usually belong to the order of the passerines. The songs produced by birds are related to their size and whether or not they are nocturnal or diurnal. Each birdsong is unique to each species. Males and females recognize their species specific song perfectly and differentiate it without difficulty from the vocalization of other similar species. Songs can vary greatly between species. Some species produce songs of long and different stanzas while others simply repeat a series of notes. There are various reasons why birds vocalize sounds. Normally these reasons vary according to the age of the animal. Young birds use calls to communicate the different attentions that they require from their parents. Gregarious birds use calls to warn of danger from potential predators and to avoid group dispersion. For example, some diurnal species use sounds to maintain communication during nocturnal migration (Ortiz Ramírez, 2012). Vocalizations are also used to indicate places where food can be located. Some birds also use calls to give the alarm to the possible proximity of danger and to teach others the characteristic sounds of their species. One of the main reasons for singing is that of reproduction. Although the development of the syrinx is the same in males and females, it is usually the males that sing to attract potential breeding partners. Males that have more powerful, more defined songs, and even those that use more varied notes, indicate to females that they are males with good health status and quality genes. There are species that defend their territories by imitating the sounds of other species. Dangerous species can be scared away by the imitation of a predator´s sound. Males also use sound to demonstrate their superiority to other males. 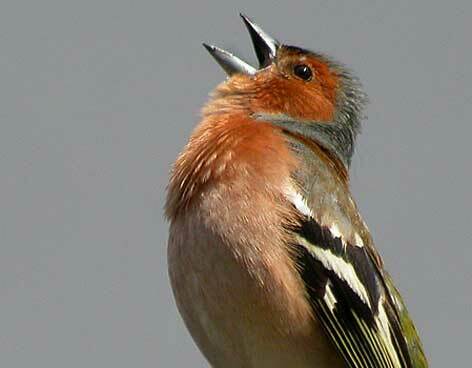 Listening to other bird species can also help integrate new sounds into the characteristic song of a species. The song of the bird goes hand in hand with the breeding season, the season of the year and daylight time. When the hours of daylight increase, testosterone is produced, initiating singing in the males. In times of less light the hormonal cycle changes, causing sounds to be reduced to simple warning calls. Nocturnal birds usually begin to sing at dusk, as is the case with owls. But females do not sing? It has been discovered that some females of tropical species also sing, some even doing duets with their partners. The melody that they produce can be the same as that produced by a single bird, or may differ so that it complements their partner´s song, thereby creating a magnificent melody. Navarro, A., & Benítez, H. (1995). El dominio del aire (No. 598.20972 N3). Jutglar, F., Mètode, R., Mètode, R., Ligero, S., Mètode, R. and Mateu, A. (2018). El canto de los pájaros. [online] Revista Mètode. Available at: https://metode.es/revistas-metode/article-revistes/el-canto-de-los-pajaros.html [Accessed 23 Nov. 2018]. Ortiz Ramírez, M. (2018). Los sonidos de las aves | Revista Cuadrivio. [online] Revista Cuadrivio. Available at: https://cuadrivio.net/los-sonidos-de-las-aves/ [Accessed 23 Nov. 2018].